Today the Kipper2k External Compact Flash Adapter that I ordered in December of last year finally arrived. After a quick and painless installation I can now replace my Amiga 1200's internal "hard disk drive" without opening the computer's case. Photos of the installation can be found here. Yesterday I finally found the time to migrate my Amiga 1200 from its original case to the new case. Preparing the new case for the migration was rather annoying: it took a couple of hours (and quite some scalpel blades) to cut out the marked recesses for the USB ports and the external CompactFlash adapter. While I was at it, I also replaced the original keyboard with the one from the repair bundle. Photos of the migration can be found here. The designers of the Amiga were far-sighted. 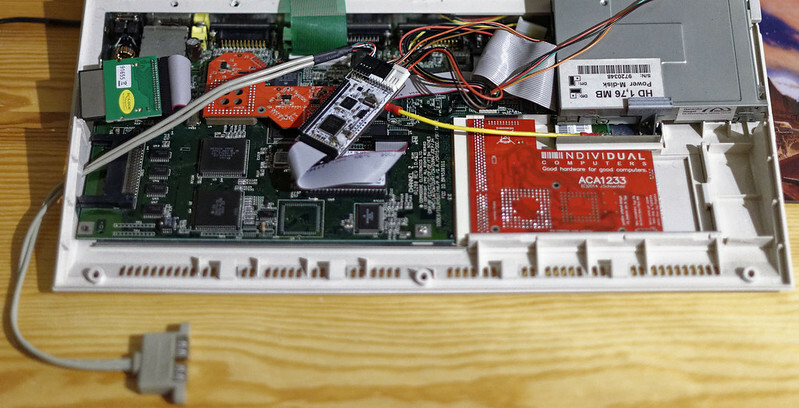 The Amiga 1200, for instance, does not only have an expansion port for processor cards but also a slot for PCMCIA cards as well as a so-called clock port. In the Amiga 1200's day, there was not a lot of hardware available that could be connected using PCMCIA. Nowadays the PCMCIA slot can be used for network and CompactFlash adapters, for instance. The "clock port" was originally only intended for attaching a real-time clock for time keeping. However, it can be used as a general purpose expansion port. Recently I bought a RapidRoad USB expansion and today I finally found the time to install it. Connected to my Amiga 1200's "clock port", it provides two USB 2.0 ports. 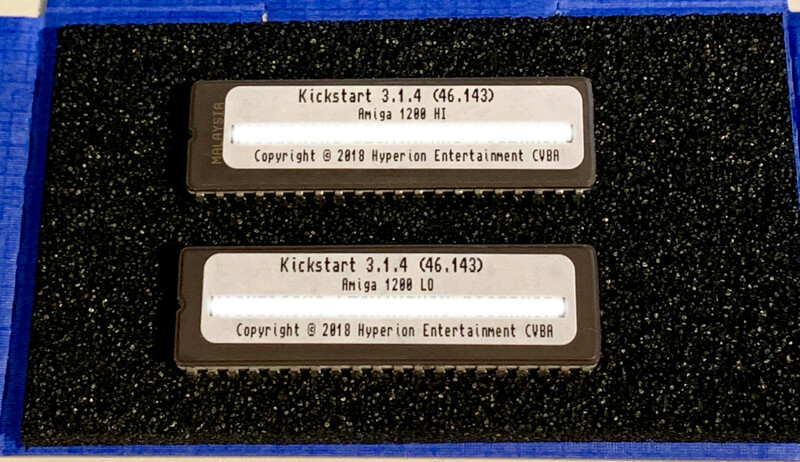 Installation of the Poseidon USB software stack was as easy as installing the hardware and now I can, for instance, use USB sticks to transfer data from my PC to my Amiga 1200. As you can see in the photo above, the inside of my Amiga 1200 is rather messy at the moment. This will change once I find the time for the move to the new case. AmigaOS 3.0 was the original operating system version that my Amiga 1200 shipped with back in 1992. In 1994, just before its bankruptcy, Commodore released an updated version: AmigaOS 3.1. One of the first things I did when I dusted off my Amiga 1200 in 2015 was to install AmigaOS 3.1 Kickstart ROMs. In the years after Commodore went under, several updates such as AmigaOS 3.5 and AmigaOS 3.9 were released. Now, in 2018, AmigaOS 3.1.4 has been released. As I was never really happy with AmigaOS 3.9, I jumped at the opportunity to use this new, cleaned up version of AmigaOS 3.1 in its stead. 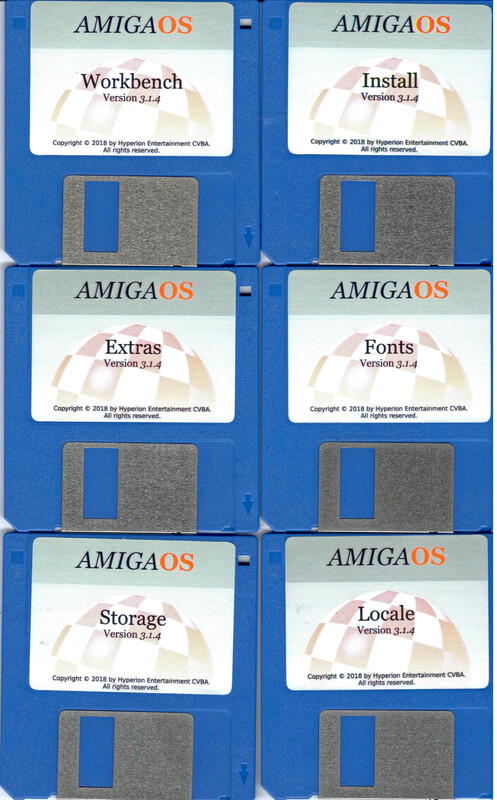 I ordered a set of AmigaOS 3.1.4 Kickstart ROMs and Workbench floppy disks from Alinea Computer. Due to copyright and license issues I had to wait a while, but eventually my order arrived. Unfortunately, the Kickstart ROMs I received do not work. Alinea Computer has promised to send replacements. In the meantime, I decided to make a fresh install of AmigaOS 3.1.4 using the new floppy disks and the old AmigaOS 3.1 Kickstart ROMs. This is possible because of a Kickstart 3.1.4 image that gets installed and is loaded into memory during system startup. Another unfortunate complication was the fact that one of the AmigaOS 3.1.4 floppy disks has read errors. I used my USB floppy emulator with AmigaOS 3.1.4 floppy disk images (that I have access to thanks to my license) to perform the installation. I am now in the process of installing the games I like to play using WHDLoad in an emulated Amiga 1200 and copy the game directories from there to my real Amiga 1200 by mounting its harddrive under Linux. There are some news with regard to Docker-ized cross-compilation and emulation for Amiga software development. Stefan "Bebbo" Franke has abandoned his fork of Krystian Bacławski's AmigaOS cross compiler toolchain. Consequently, I no longer maintain the Dockerfile for this toolchain. But do not worry: Stefan still maintains the GNU Compiler Collection, along with binutils and other useful tools, for AmigaOS cross-development on Linux. 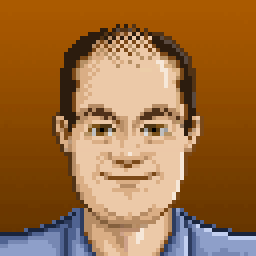 His new project can be found here and my Dockerfile for it is available here.